This is a fun, casual “mini discussion” that can be used to get students generating and sharing ideas in a low-stakes setting, and to help build a culture of discourse and develop discussion skills within a group. It’s an interesting and fairly easy topic for students to think about and participate in. Students tend to love talking about the “most,” “least,” and “how many” facts about nature. 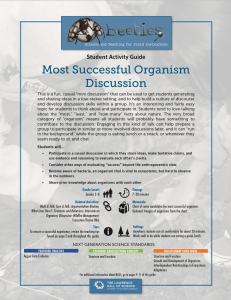 The very broad category of “organism” means all students will probably have something to contribute to the discussion. Engaging in this kind of talk can help prepare a group to participate in similar or more involved discussions later, and it can “run in the background” while the group is eating lunch or a snack, or whenever they seem ready to sit and chat. Participate in a casual discussion in which they share ideas, make tentative claims, and use evidence and reasoning to evaluate each other’s claims. Consider other ways of evaluating “success” beyond the anthropocentric view. Share prior knowledge about organisms with each other.